The beloved 1951 Rodgers and Hammerstein musical classic, “The King and I,” was adapted from the 1944 novel, “Anna and the King of Siam,” by Margaret Landon, which was inspired by the memoirs of Anna Leonowens, the English governess to the children of King Mongkut of Siam (now Thailand) in the early 1860s. Clearly establishing the time period, Hammerstein’s book features several references to the war Abraham Lincoln was dealing with in the U.S.; the King wants to send elephants to support the President in battle. The main story focuses on the prickly but evolving relationship between the indomitable proto-feminist Anna and the irascible polygamist potentate, who’s trying to upgrade himself from “barbarian” to citizen of the Western world. There’s secondary plot about Tuptim, a wife sent to the King as a gift from the King of Burma, and her secret beloved, who ultimately meets a tragic death, though this is, for some reason, omitted from the Welk Theatre production. The show is solid, if not stellar. Under the direction of Joshua Carr, with musical direction by Justin Gray, the singing is superb. The leads and soloists are compelling overall, though there are a couple of weak links. The 4-piece band sounds mightier than its diminutive size. The staging is respectable, if not imaginative. There’s nothing new injected into an old show to goose it a bit for modern audiences. Richard Bermudez, who’s played the role of the King three times before, is excellent. He has all the Yul Brynner authoritarian arms-akimbo moves; he’s imperious, playful (not to mention handsome and hunky). 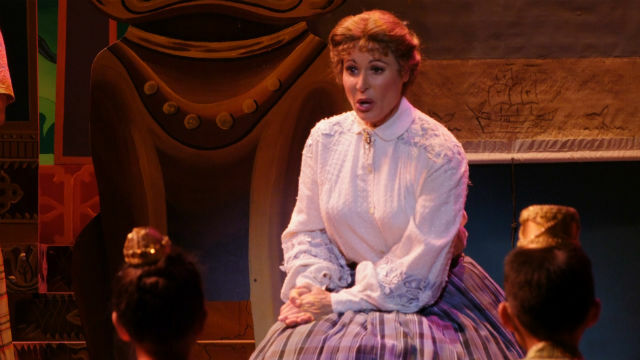 Victoria Strong (her name matches her voice – and her British accent) is outstanding as Anna, equal parts dogged insistence and reluctant compromise. In this production (though not in some others) there’s no doubt that she had fallen in love with the King; it becomes most evident at his death. That moment, usually an unabashed tearjerker, is where the shortcoming of the show is most revealed. Although all the elements are here: the “Uncle Thomas” ballet is well executed (choreography by Joanna Tsang). The costumes are lovely (from the Theatre Company in Northern California), though the set (Doug Davis) feels tacky, given the opulence of some of the outfits. What’s missing is in the emotional realm. The most poignant moments (especially the King’s death) feel rushed, diminished. And this, of course, affects the viewer’s ‘heart’ response to the material. The intellectual stuff is there: Hammerstein’s cleverness, the issues he raises of bigamy and class. Rodgers and Hammerstein loved to insert serious concerns into their most famous musicals, but they were still basically love stories. This is the most oblique of romances, but we root for it just the same. We want to feel a little … farklempt at the end. That didn’t happen on opening night. But maybe, over the course of the very long run, as the ensemble gels, deeper character development and sentiment will settle in. Performances are 8 p.m. on Thursday and Saturday, and 1 p.m. Thursday, Saturday and Sunday.